here is an example of a mourning dinner dress a lady of fashion would have worn in January 1819. I think the dress is beautiful and I love the black feathers in her hair. What do you think about it? Would you have worn it? 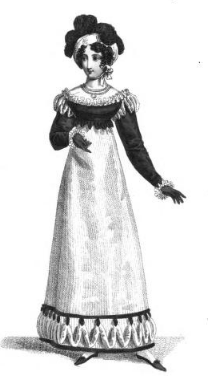 White crape frock with pointed festoons of the same, fastened at each point by black rosettes, and folds of black satin placed above and below the festoons. Black satin Canezou spenser, elegantly ornamented with white crape. Frederica hat of white crape, surmounted by a plume of black feathers. Necklace of jet; black gloves and slippers.